For Diane Goldner, what began as an investigative story for The New York Times, became a four-year pilgrimage into the thriving yet controversial world of energy healing in America. Her report, How People Heal, serves as both an introduction to this world, and an engrossing narrative featuring in-depth portraits of healers Barbara Brennan and Rosalyn Bruyere. Goldner spent hours alongside these spiritual and savvy women witnessing their healing work, while casting a critical eye at the business side of their organizations. 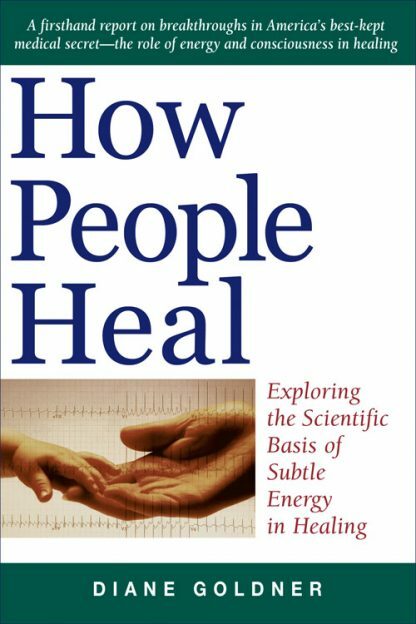 How People Heal also introduces you to physicists mapping the effects of love and desire across time and space, nurses using therapeutic touch on hospital patients, and heart surgeons using energy medicine in the operating room. Most important, you�ll meet Jonathan Kramer, Doris Dennard, Marilyn Schneider, and others like them, whose lives and life-threatening illnesses have been transformed by the work of energy healers. Diane Goldner has a hands-on healing practice in Los Angeles and New York and does long distance healing with people around the country and internationally dealing with cancer, trauma, surgery, high blood pressure, arrhythmia, infections, relationships, fertility, grief, abuse, business issues and many other things. Diane is the author of How People Heal: Exploring the Scientific Basis of Subtle Energy in Healing (Hampton Roads), originally published as Infinite Grace. She is a certified teacher of Awakening Your Light Body and the graduate Light Body Course, Radiance.